Size comes to those who simplify. Stop chasing your tail and follow Jay Cutler's lead to look your best this year, next year, and a decade from now! Four-time Mr. Olympia Jay Cutler is the everyman of the bodybuilding elite. Approachable, humble, and honest, he's kind of like the guy next door... who just happens to weigh 280 pounds with near-zilch body fat. True to form, if you meet Jay, he's not going to blow your mind with round-the-campfire tales of epic workouts or cutting-edge tactics. In fact, his training routines are almost legendary for their extraordinary lack of novelty. He does more than lift things up and put them down, but not much. On the other hand, this means that nary a second of Jay's time in the gym over the years has been wasted. Few if any of us can say the same thing. So while fans may be hungry for his training and nutrition "secrets," Jay is quick to point out it's no secret at all. Here are 10 of his most fundamental rules for maximizing your own physical potential while preserving your sanity. You're not likely to find Jay doing exotic exercises or using gimmicky equipment. In a montage of his workouts of the last 20 years, the haircuts would change more than the movements. You'd see him doing a lot of bench presses, squats, rows, pullovers, press-downs, and preacher curls. Why? They work. You're not likely to find Jay doing exotic exercises or using gimmicky equipment. These six movements are almost foolproof mass-gain tools for even the most desperate of hard-gainers, as well as for someone with Jay's peerless genetic makeup. That's why you'll find all of them throughout his Living Large 8-Week Mass-Building trainer. Rep ranges? The usual prescription of 8-12 for size is where the magic happens, in his opinion. Conventional wisdom is that larger body parts need 12-16 sets of work in order to grow. But conventional wisdom doesn't win four Olympias. It's not uncommon for Jay to perform 3-4 times that number of sets for a given body part—while never reaching failure, as he told us in the article "Lifelong Lessons on Building Mass." He doesn't do this as a shock tool; it's a normal part of his routine. 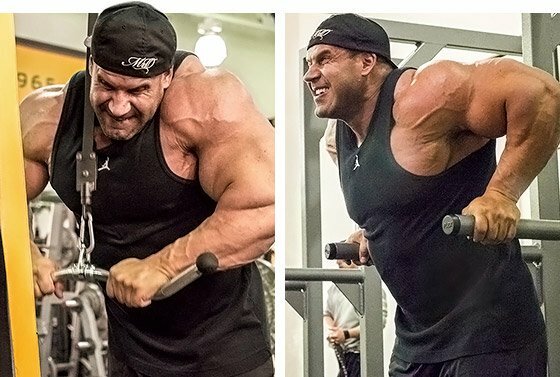 Where many other bodybuilders add reps and cut down on sets, Cutler says he prefers to go heavy for fewer reps, and add more sets. "You can't do as many reps, or you'll burn yourself out," he says. This contributes greatly to the dense muscularity he has come to be known for. "I need to make sure I get enough sleep," (Jay) says. "That's the most important thing." Beginners can get great results from full-body routines, but for advanced lifters there's no substitute for a well-designed split. Longtime lifters know the quickest way to plateau is to fall in love with a single workout, bang it out, and then head back to the gym to do the same thing before you've had a chance to fully recover. Jay insists on getting enough rest between sessions for the same body part, but grants that this is different for most people. What doesn't vary between people is the importance of horizontal rest. "I need to make sure I get enough sleep," he says. "That's the most important thing." The "rest as long as you need between sets" crowd may seem to make a compelling case. But their message falls on deaf ears when it comes to Jay. He rarely rests longer than a minute, even on his heaviest sets. It allows him to do more, live more, grow more, and eat more, staying both huge and ripped year-round. He's onto something. A study from the College of New Jersey reported that when men bench pressed with just 30 seconds of rest between sets, they burned over 50 percent more calories during the workout than when they rested 3 minutes. Another from the University of Southern California, recently published in the "European Journal of Applied Physiology," found that men who rested a minute between sets built more strength and size than men who rested four minutes. Bigger, leaner, stronger—what are you waiting for? Get back to work. Jay has never been shy about hitting a body part twice in a week if he feels the need. He has famously committed to twice-per-week back sessions, but with different focuses. One focuses on vertical pulls and deadlifts, and the other is heavy on horizontal pulls. This has helped him build a three-dimensional set of lats with show-stopping east-west development. Competitive bodybuilders have to ruthlessly critique their physiques, because if there's one thing they can be sure of, it's that judges will do the same thing. Remember, Jay competed in six Mr. Olympia competitions before finally winning. And as he told us in "Big Lessons," what he learned from these losses was what finally allowed him to win. Years ago, realizing that his back and legs needed more fine-tuning in order to for him to stay competitive, he adjusted his training, going harder, heavier, and more often for these now lights-out muscle groups. The lesson for you: Physique athletes can't afford to be sensitive. They need to attack weakness head-on. The amount of bodybuilding information out there is growing exponentially. You can find more than you can read—and definitely more than you can use—about weight loads, volume, frequency, advanced techniques, and even training times. Physique athletes can't afford to be sensitive. They need to attack weakness head-on. You might think that a world-class competitor like Jay stays up on all of this, and is always looking for tiny tricks to help maximize his performance. On the contrary, his primary guide is purely subjective—how he feels. "I train whenever my body feels ready to train," he says, ignoring the science that says late-day training yields better results. Jay adds that what works for you today may not work tomorrow. Six sets of squats are scheduled, but your pins are toast after four. You've got meal number three in hand, but no microwave to cook it in. What to do? You do what you have to, no matter what you're "supposed" to do. While Jay feels it's important to have a plan, he says you should never be so consumed with the routine that you can't improvise. Though some might think this type of approach is a recipe for distraction, they don't have Jay's overall level of commitment. He says his approach helps him keep things fun and interesting in the gym, and that's what has ultimately kept him coming back to the gym for decades. Even if you don't have any aspirations to be Mr. Olympia, you can still elicit tremendous changes in your body, health, and athletic performance by taking a winning approach to your food at home, at work, and even on the road. "I tell people to put as much effort into their diet as they do into their weight training," says Jay. "I tell people to put as much effort into their diet as they do into their weight training," says Jay. This type of mentality, he says, will yield new and drastic change for anyone—almost regardless of your goal. In the last decade or so, bodybuilding judges have become consumed with identifying the best glute-ham tie-in on stage, making hamstring training more of a priority for competitors. But Jay and his peers are mostly seen—especially offstage—from the front. So train for balance, sure, but don't forget that there's no substitute for a monster set of quads. Going through the motions with a few sets of squats, then skipping over to the leg extension machine isn't going to cut it if your goal is to get 'mired. Jay's quad routine includes those staples, but incorporates the leg press, hack squat, front squat and walking lunges as well. Hit it from all angles, like in Jay's toughest workout ever, and the results will be visible from all angles. Jay Cutler didn't win four Mr. Olympia titles by splurging on the road. Here's his 5-step plan to navigate the challenges of living a clean, hard-training life when you're away from home.